Ralph Ellison (Mar 1, 1914): Invisible Man (1952) is available at RPL, written by the African-American author. It addresses issues of social justice in the face of the early twentieth century, and has probably been on your reading list either in high school or college. If you enjoy Invisible Man, you may also like James Wheldon Johnson’s novel The Autobiography of an Ex-Colored Man, available online. Theodore Geisel (Mar 2, 1904) aka Dr. Seuss: Rumor has it he wasn’t much of a kid person. Nevertheless, his countless magical children’s story books probably introduced you to reading. The library has over 25 of his books available in the Youth section (on the first floor). Feel free to browse our selection and take a few home to read to your younger siblings or children. Also available in the Compact Shelving is a collection of his private illustrations published in Dr Seuss: The Cat Behind the Hat. Elizabeth Barrett Browning (Mar 6, 1806): “How do I love thee? Let me count the ways…” Browning penned this famous line and others in Sonnets from the Portuguese, available in stacks and online. The works of this Victorian poet are said to have influenced the writings of Emily Dickinson and Edgar Allan Poe. Kenneth Grahame (Mar 8, 1859): Also available in the Youth section is Grahame’s famous children’s book The Wind in the Willows, first published in 1908. If you want to know more about the author you can check out Kenneth Grahame’s The Wind in the Willows: A Children’s Classic at 100, written by Donna R. White, one of ATU’s own professors of English. Jack Kerouac (Mar 12, 1922): The quintessential beatnik writer whose writing inspires road trips and self discovery, Kerouac’s novels On the Road and The Dharma Bums are both available at RPL, and many more. If you like these, you can also read up on another Beat Generation writer, Allen Ginsberg, and watch the movie Howl, starring James Franco and featuring Ginsberg’s most famous free verse poem. Lois Lowry (Mar 20, 1937): Lowry is best known for her dystopian novel The Giver, at a time when young adult dystopian novels weren’t a dime a dozen. In addition to The Giver are three more books to the series: Gathering Blue, Messenger, and Son. The complete series is available in the Youth reading section, as well as Number the Stars. You may be familiar with the title of the latter if you remember reading passages of this Holocaust survivor tale back in middle school. Despite its location in Youth reading, Lowry’s writing tackles complicated situations, sometimes from the perspective of the very young, that grown readers can still find challenging and inspiring. Tennessee Williams (Mar 26, 1911): Chances are you have read one of Williams’s plays in high school, or maybe your school put together its own production of Cat on a Hot Tin Roof or A Streetcar Named Desire. Unless you’re learning the craft of playwriting, it is more appropriate to watch his works rather than read them. Check the DVD collections on the first floor to find the famous Marlon Brando and Vivien Leigh rendition of Streetcar, and if you want to see Cat on a Hot Tin Roof you can request it through interlibrary loan from the Ozark campus collection. Robert Frost (Mar 26, 1874): Writer of the most-used graduation poem of all time (not to mention its common misreading of said poem), Frost’s books of poems are known to be dense with symbolism and nature. Take a look at our selections if you feel like unpacking these poems in your spare time (or when the Wi-Fi is down). Anna Sewell (Mar 30, 1820): Black Beauty is one of my favorite books of all time and I have no shame in this. Unable to write the manuscript herself due to declining health, Sewell had to recite the story while her mother wrote it down. Written in the late nineteenth century, the famous tale of a horse’s life of cruelty and friendship was published at a time when animal welfare was just beginning to reach popularity in England. The library has the book available in Youth reading, but if you ever get a chance to watch the 1994 film version (unfortunately not available in the library), you’ll get the rare pleasure of seeing a movie in which actor Sean Bean plays a character who does not die. 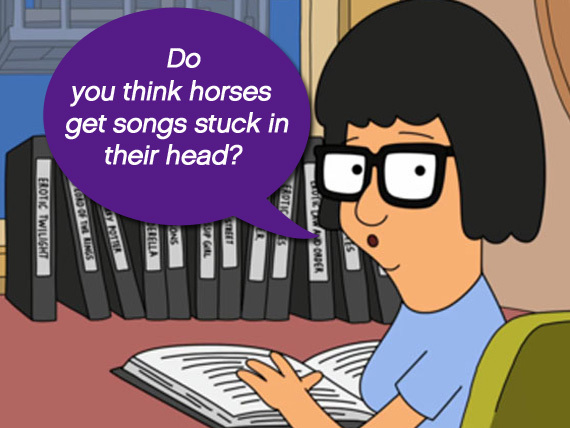 Let your inner Tina Belcher rejoice in one of the best film adaptations of Sewell’s classic animal tale. If it’s the movie soundtrack, definitely. Take a look at some of these authors’ works, either to introduce yourself to their writing or to relive your favorite childhood book. Keep in mind that the library’s opening hours will change during Spring Break (March 21-28), and will resume normal hours after the holiday week. Happy reading!